Yesterday we walked around downtown Kuala Lumpur. It seemed there was a construction crane in every block. Tall glass and colorful office buildings towered over three and four story residences and shops. 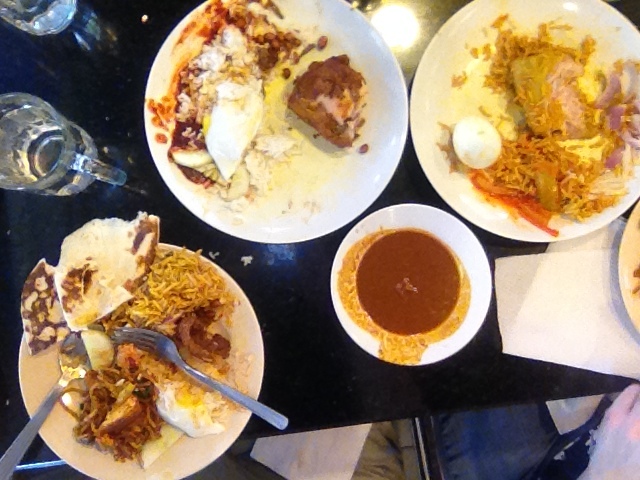 We ate lunch at a busy Malaysian cafe. It was muggy and hot and the air conditioning of a modern six level shopping mall was refreshing. I feIt like I was at a brand spanking new Mall of America. There was Christmas music over the PA and shiny decorations. Back at the hotel I went for a swim with French and British kids. There was a fancy New Years Eve buffet with live music from the 70s and 80s. The English was at times peculiar and reminded one of our team of the Chinese Restaurant sequence in A CHRISTMAS STORY movie. We met at the hotel lobby at 4:50 am to begin our day of travel to Chiang Mai, Thailand. We had a snack before departure at a fast food place named Puffy Buffy.